How many curries you know cook in 10 minutes? 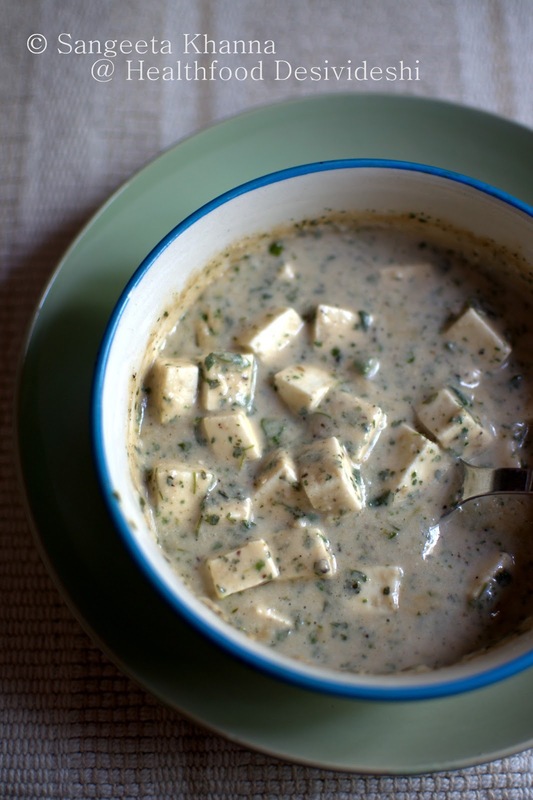 Think about paneer if you don't. Paneer and some sun dried kasoori methi don't need any peeling and cleaning so you save precious time and if you don't use onion and garlic your job is easier. This kasoori methi paneer or methi malai paneer cooks in just 5 minutes if cooking for 2-3 people and the rest 5 minutes goes into preparations. A very rich looking, mildly spiced creamy yummy curry that can make a quick meal with chapatis and a green salad on the side. I had it with a fasting platter of Sama ke chawal ki tehri (fried rice made with Barnyard millet) and zucchini and onion raita. Make a paste of the above ingredients, adding water to make a creamy batter like paste. Cube the fresh paneer in required size, mix it with the kasoori methi, the paste and place everything in a thick bottom pan. Simmer for 5 minutes, stirring all the while. Adjust consistency by adding water if required. Check seasoning and serve hot. Tastes great with plain chapatis and some raw green salad on the side. That's it. The recipe is a breeze. You can also microwave this mixture for 3-4 minutes with 2-3 breaks to stir the ingredients and the curry will be ready in a jiffy. I cooked the recipe in the same bowl it is served here. In microwave. 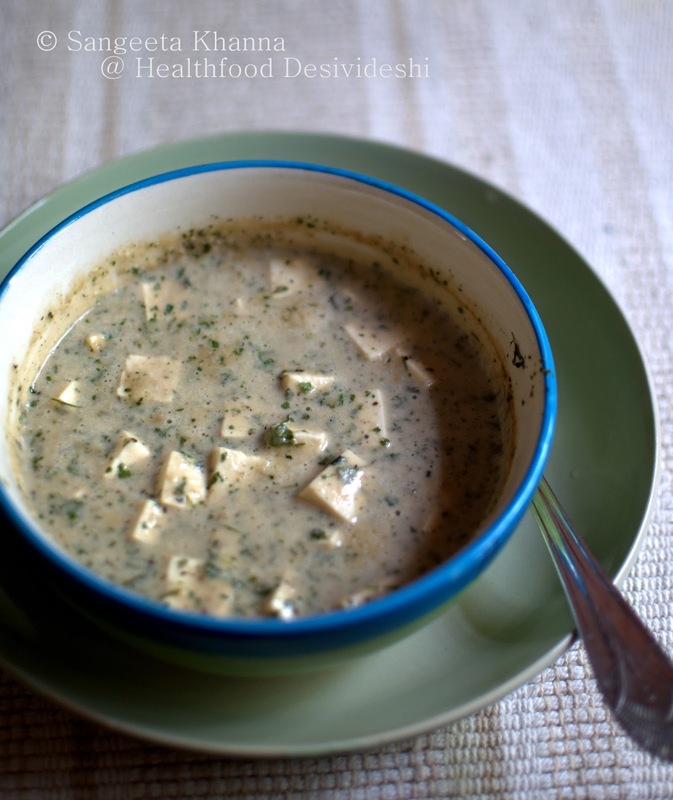 You can also cook cauliflowers almost the same way to give a rich and creamy gobi methi malai. You can always change the spicing a little bit to suit your choice. The curry is incredibly creamy and yet light. Certainly lower on fat than real cream and you see there is no cooking oil or ghee used here as well. I used home made paneer that was made and leftovers refrigerated the previous day.